A hike to the Boreas River along the Hewitt Eddy Trail is a perfect leg stretcher for travelers along NY 28N. Whether it's a 0.8 mile hike to the river or a complete 2.8 mile loop utilizing the trail plus NY 28N, this pleasant hike is well worth the time. Hewitt Eddy is where the cascades of the Boreas River end suddenly at a large pond like pool. Hewitt Eddy is marked incorrectly on the trail map below. 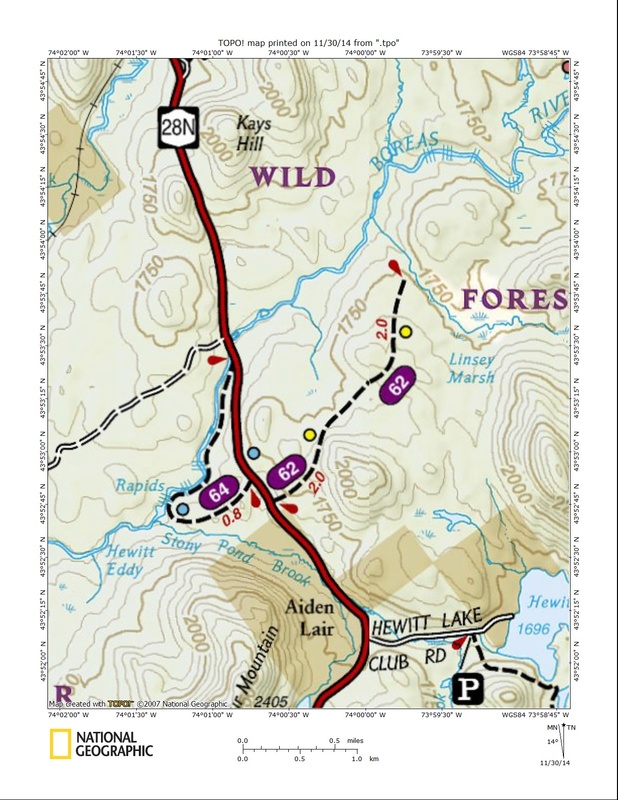 There are two trailheads for the Hewitt Eddy Trail, one near the bridge for the Boreas River along NY 28N (northern trailhead). There is a large parking area on the east side of the road. There are primitive drive in campsites located here as well (FREE CAMPING), near the river. The start of the trail is across the busy road. The southern trailhead is located 0.8 miles to the south along NY 28N with parking along the shoulder of the road. From the southern trailhead it's 0.8 miles to the Boreas River and Hewitt Eddy. Along the way the trail briefly follows along the scenic Stony Pond Brook. From the southern trailhead it is 1.2 miles to Hewitt Eddy, however most of the hiking is along the beautiful Boreas River. You can either do a out and back hike or utilize busy NY 28N to create a complete loop. If you walk along the shoulder of this busy road, be sure that you take care to keep yourself safe. There are directions with gps coordinates below as well as a trail map and a video of this wonderful hike. The Hewitt Eddy Trail is trail 64 on the map. Directions: Take NY 28N out of North Creek toward Minerva. The southern trailhead is 8.1 miles north of Minerva along NY 28N and the northern trailhead is 8.9 miles north of Minvera at the bridge over the Boreas River. The GPS coordinates for the southern trailhead is N43 52.829 W74 00.684 and N43 53.488 W74 00.875 for the northern trailhead for those who have a GPS devise in their vehicle.